Hi everyone, so sorry I've been away for awhile, but I just returned from photographing a friend's wedding out of state! I was a physical and mental wreck preparing for it since I'm an amateur photographer, and it was for a REALLY close friend so I REALLY didn't want to screw it up, but it mostly went well. Whew! What a relief. The other night, I was finally catching up on my Netflix queue, and was watching the documentary Food, Inc. If you've read Michael Pollan's powerful and influential book, "The Omnivore's Dilemma", this movie is based on that as well as Eric Schlosser's book "Fast Food Nation". Both authors are calm yet factual and authoritative voices., and this documentary does a great job of simply and vividly pointing out how flawed the US food system is. (On a positive note, they included a visit to the Polyface Farm in Virginia, which is "grass-based" not "corn-based" and uses the natural rotation of fields and animals). 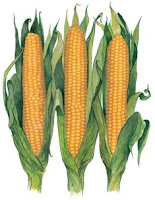 And although corn has yet to "break into" the top eight allergens in America, it's only a matter of time since it's in practically everything. I'm sure those who are corn-allergic are having a really difficult time since it's in things you would not expect, like baking powder (which sometimes has gluten, btw.) 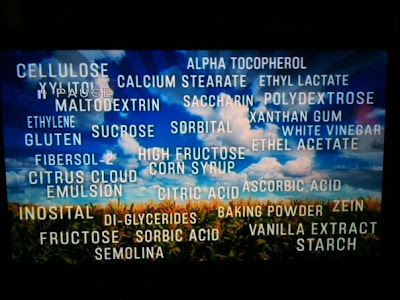 Here's a screen shot of just a few corn-based items from the movie. I also want to bring to your attention Sharon Rosen's site of www.livecornfree.com has posted a really great list of all the ingredients which contain corn. Another scary statistic is that 90% of the soy used in America comes from Monsanto's genetically modified soybeans that are designed to thrive despite being treated with Roundup pesticides. So when possible, try to purchase soy products that are as close to organic as you can! "Mexican Coke is corn free! Seriously, I rarely drank soda before, but since I found out about my corn allergy, I really miss it sometimes. The Coca-Cola in the Mexican food aisle is made with cane sugar and no citric acid. It's a dream come true. Thank you so much for posting this. A corn allergy is tough. Potato starch is your friend, and pretty much anything in a can, box or bag is THE ENEMY! The coke sold for Passover is also corn free. In fact, I have learned that many kosher foods are safe for me to eat. Hebrew National hot dogs are good, too. I am not a hot dog eater, but for cookouts it is nice to be able to eat something normal, even if you can't eat it on a bun, as a normal person would. Aunt Millies does make a hot dog bun that is corn free, but it is a weird, seldom found in the real world line.